Our Pine Island Pest Control Exterminator will identify the source of the pest infestation and create a customized treatment plan to eliminate the pests. 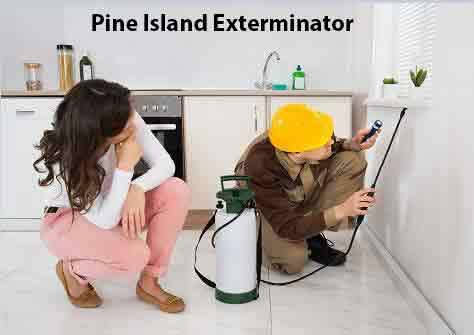 Let us be your Pine Island Exterminator, Give Us A Call Today. 1-844-305-8999. The Groundhog also known as the Woodchuck are well adapted for digging, and live and hibernate in burrows, which typically have a main entrance and one or more escape entrances on your property. Groundhogs are known to burrow under sheds, fences, pools and even along the foundation of homes and businesses. The undermining of the soil beneath these areas can lead to the collapse and destruction of a property. If you have Groundhogs on your property that you would like removed. Give Our Pine Island Exterminator A Call Today. We humanely Trap Groundhogs utilizing Havahart Traps and Relocate them. While many homes throughout Pine Island NY have carpeting in them that are soft and comfortable, they are a haven for dust mites. Though the house dust mite is not visible to the naked eye they still cause many health-related issues. Dust Mites feed on organic detritus, such as flakes of shed human skin, and flourish in the stable environment of dwellings. House dust mites are a common cause of asthma and allergic symptoms worldwide. The mite's gut contains potent digestive enzymes that persist in their feces and are major inducers of allergic reactions such as wheezing and coughing. Property damage caused by raccoons in Pine Island NY is most commonly due to their desire to find food as well as their need to locate shelter. A raccoon will often try to find shelter in attics and other areas in your home or business. A mother raccoon and her kits have been known to pry up roofing tiles to gain access. Once inside, raccoons will leave behind urine and feces and can be very destructive. Our Pine Island Exterminator is trained to handle and remove raccoons from your property.